U.S. President Barack Obama (C) and other leaders of the 21-member Asia-Pacific Economic Cooperation (APEC) summit wave to the media after an official "family photo" in Manila, Nov. 19, 2015. Leaders at the Asia Pacific Economic Cooperation forum spent two days stressing inclusion and integration, while showing signs of growing divisions over the U.S. led Trans Pacific Partnership free trade agreement. Philippine President Benigno Aquino, who hosted the APEC forum that ended Thursday, praised the progress made toward regional integration and the strong support for increasing multilateral cooperation expressed during the leaders' summit. “Since inclusive growth has always been the guiding principle of our administration, we are proud to have put this approach front and center throughout our hosting APEC this year,” said Aquino. Despite the summit’s focus on unity, separate factions are emerging within APEC over the U.S.-led TPP free trade agreement. President Obama met separately this week with leaders from the 11 other APEC nations that are part of the TPP to urge them to quickly ratify the deal. APEC is made up of 21 member states in Asia and the Americas that together account for nearly half of world trade. The United States, Japan, Malaysia, Vietnam, Singapore, Brunei, Australia, New Zealand, Canada, Mexico, Chile and Peru make up the TPP founding members. Obama faces significant resistance to TPP ratification, even from some members of his own party, including Hillary Clinton the leading Democratic Party candidate for president. She opposes the trade pact because it does not do enough to protect American workers and jobs. U.S. Trade Representative Michael Froman, who is in Manila for APEC, says he expects Congress to vote on the free-trade deal early next year. Most other APEC members, including South Korea, Indonesia, Thailand and the Philippines, have expressed interest in joining the TPP. Philippine President Aquino met with Obama to solicit his help in joining the trade pact that sets labor and environmental standards, and also requires countries to lower protectionist trade and investment barriers. The Philippines would likely have to amend its constitution to allow a greater share to foreign investors in certain industries. Aquino voiced concern the TPP standards may be too high for all interested countries to meet. “If the whole idea is to broaden trade, making it exclusive actually defeats the whole purpose of why you enter into all of these agreements,” Aquino said earlier in the week. Supporters and critics have described the TPP as part of a U.S. strategy to counter China’s growing economic strength in the region. 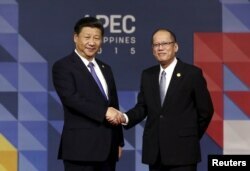 China's President Xi Jinping (L) is greeted by Filipino President Benigno Aquino III as he arrives for the Asia-Pacific Economic Cooperation (APEC) leaders meeting in Manila, Nov. 19, 2015. Chinese President Xi Jinping used the APEC forum to push for further progress to develop the rival Free Trade Area of the Asia-Pacific, a multi-lateral free trade pact. He also offered veiled criticism of the U.S.-led TPP as being too restrictive and exclusionary. "We need to encourage equal footing participation and extensive consultation and make free trade arrangements open and inclusive to the extent possible,'' said Xi. Russian President Vladimir Putin, who did not attend the APEC summit, also voiced concerns over how the TPP was developed in secret under U.S. leadership. "However, the confidential nature of the Trans-Pacific Partnership hardly facilitates the sustainable development of Asia Pacific," said Putin. Russia’s representative at APEC, Prime Minister Dmitry Medvedev, said Wednesday world trade rules should be drafted within the framework of the World Trade Organization, not regional groupings. TPP supporters argue the pact sets a high standard for trade rules that will liberalize trade and investment, create jobs and promote economic growth. Member nations released a statement this week saying the trade pact creates a “new and compelling model for trade” that will alleviate poverty and strengthen links among their economies.